Peter's Children: Amy, 1871-1961; Ellen Sarah (died in infancy); William Alfred (died in infancy); Thomas Henry ("Harry") 1876-1932; Jessie Elizabeth Woods 1877-1938; William Alfred 1879-1957 m. Marian Hocknell 1886-1971; Bert 1881-1956 (is that your great grandfather Perter Herbert? He had a son called Harold); James Arthur 1883-1951; Edith May Woods 1886-1981 (my grandmother. Her husband and Jess's were bothers); Mabel Sarah Taylor b 1891; Gladys Evelyn 1894-70; Amy (died in infancy). lily8 wrote: Finding Constance was quite a challenge as there are no BMD's online I found a grave reference for Ellen/Nellie Ascroft Prime (nee Foley) she had a long life exceeding 90 years. Of Constance no trace until I found a border crossing for Ellen and her husband and both listed a David (couldn't attempt a try at surname as too badly written) as a son in law. This led me to thinking that Constance was dead (early 1940's) so I tried for a grave in Calgary and finally came up with a Constance Drinnan died 1936. Following that I found a family tree on Ancestry showing a David Drinnan but with wife and children listed as Private. I know that David Drinnan married a second time so the hildren and there are a lot of them may or may not belong to Constance. I have no evidence to back any of this up other than the crossing record, so with your permission I would send a message to the tree holder to see if they can confirm?????? Hello again, I looked more closely into it using your research (thank you) and I found David M. Drinnan married Constance Ascroft in 1931. Just a quick update I had another look at the border crossing record and can now confirm after checking a border crossing record for David Drinnan that the 2 addresses are the same 202 8th avenue Calgary. David Drinnans BC records show him as David McDonald Drinnan born 2/11/1897 Glasgow (died 11/1/1983), he may have married Mary (possible surname Mc Nulty) I suspect 1938 and appears a possible two children with her. Hopefully the Archivist may shed further light. Bizarrely, I found a photo on billiongraves.com of a gravestone headed DRINNAN and showing David M 1902-1996 and Mary A. 1906-1981, located at St Mary's Cemetery, 3032-3120 Erlton St. Southwest, Calgary, Division 6, Alberta. The names and location fit, but the dates are different. I was thinking that it can't be the 1900 Garden Party as Peter Ascroft was only elected mayor in November that year. So the photo must have been summer of 1901, as he's wearing his chain of office. However, searching the British Newspaper Archive I can't find any reference to a 1901 Bootle Garden Party (though the 1900 one gets quite a long article, and as you say P Ascroft and his wife were at the 1900 party as guests of the Mayor. Thanks Bob. 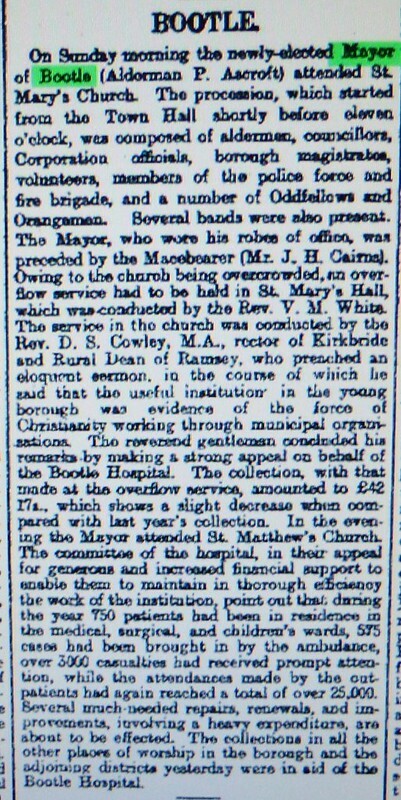 Yes, so the article confirms Ascroft was elected Mayor in November 1900, too late to hold a garden party that year. Therefore the photo of him as Mayor at the Garden Party must have been taken the following summer, say July 1901, when his mayoralty would have still had about 4 months to run. I did find a newspaper report of the garden party the previous year (1900) but so far nothing about 1901. Maybe Ascroft forgot to invite the Press! Hello Lindy and thanks for the information about the Ascrofts. Looking forward to seeing the 1942 wedding photo. Do you have any Ascroft pictures that are older than that? Recently I had the pleasure of visiting the Bootle Fire & Rescue Centre on Bridle Road (L30 4YD), for a most interesting tour of the history of Bootle Fire Service. The two retired "Old Sweats" who give the history backed up by various snap-shots & take you around some incredible artefacts are hilarious. Great banter. MEANWHILE.....I not sure how to book a tour there but their phone # is 0151 296 4000...……...and as my Mother drilled into me; "If you don't ask...….You don't get"